Think you can't drink wine with salad? Think again. The secret is in the dressing. Think you can’t drink wine with salad? Think again. The secret is in the dressing. Salad is no longer just the staple diet of rabbits and ladies who lunch. These days, salads can easily be main courses, as larger portions supplemented with meat, poultry, fish, cheese, tofu, legumes and hearty vegetables are popping up everywhere—from fast food joints to white-tablecloth restaurants. Consumer demand for lighter fare, not to mention the surging popularity of the grilled chicken Caesar, has had a lot to do with the proliferation of salad. So has chefdom’s ongoing effort to experiment with and reimagine every component of the meal. The salad bowl, so accommodating of contrasting flavors, colors, textures and temperatures, is an ideal laboratory for the kitchen alchemist. One thing most salads have in common is some sort of dressing, and traditional vinaigrette-based dressing has made salad notoriously difficult to pair with wine. Wine snobs of yore had one piece of advice when it came to matching wine with salad: Don’t. The vinegar in the dressing, they said, would make the wine taste sour. More recent science has revealed, though, that when the acid in wine meets a similiarly acidic element in food, the end result is that the wine’s acidity is less intense, not more. That is, if it’s a proper match. Today’s salad-loving wine enthusiasts offer several strategies on how wine and raw veggies can coexist at the table. First, make the dressing with a less acidic component than plain old-fashioned vinegar. Second, consider adding a fruit to the salad that will complement the fruitiness of the wine. Third, don’t forget to match the wine to the other ingredients in the salad. "I don’t find today the taboos that there were 10 years ago about wine and salad," says Carolyn Wente, president of Wente Vineyards in Livermore, California, and author of The Casual Vineyard Table (Ten Speed Press, 2003). Making a salad friendly to wine may not be a taboo subject, but does take a little know-how. Wente likes to make dressings that contain mild fruit vinegars, or the juice of mild Meyer lemons. "You don’t get that volatile acidic character you can get with vinegar. If you don’t have Meyer lemons, you can use regular lemon juice and orange juice in equal proportions," says the fourth-generation winemaker. Likewise, some wine vinegars aren’t harshly acidic. Wente suggests taste testing to find a milder brand that you like. She makes her own vinegar with leftover wine that’s beginning to oxidize, something anyone can do just by pouring the wine into a covered barrel or glass container and letting nature take its course. Wente keeps refilling the container with wine that is too old to drink, and she has a steady supply of her own house blend. Claire Criscuolo, chef/co-owner of the vegetarian Claire’s Corner Copia and the newly opened Basta Trattoria, both in New Haven, Connecticut, takes a similar tack, eschewing full-strength vinegars in favor of milder alternatives. Criscuolo, author of Claire’s Italian Feast: 165 Vegetarian Recipes from Nonna’s Kitchen (Plume, 1998), makes vinaigrettes with organic golden balsamic vinegar, which is milder still than the already mild dark balsamic. (Golden balsamic is available in health food stores or online.) She also uses liqueurs such as limoncello, which is lightly acidic and adds a bit of sweetness to balance the acidity of the wine. "It has a fruitiness without high acidity. There’s a sweet brightness that you get," she says. Another way to make salads more wine friendly is to add fruit to them. Fruit will share flavor characteristics with wine, says Wente, which will make the wine more compatible with the salad. Wente and her staff at the Restaurant at Wente Vineyards have devised a number fruited salads using the local produce that California is famous for: peaches, apricots, melons, berries, figs, persimmons, pears, apples, pomegranates, cranberries, currants—just about any fruit is fair game for the salad bowl. The Casual Vineyard Table includes a cantaloupe and shrimp salad, dressed with a lime juice and rice vinegar vinaigrette (rice vinegar is another mild vinegar), which Wente says she serves with a crisp white such as a Gewürztraminer, or a rosé. At Criscuolo’s Basta Trattoria, the Basta Salad is a mix of bitter organic greens, toasted almonds, pears, berries or dried cherries (depending on the season) and Gorgonzola cheese. She dresses it with her limoncello vinaigrette and recommends a Tuscan white, Teruzzzi & Puthod Vernaccia, to go with it. 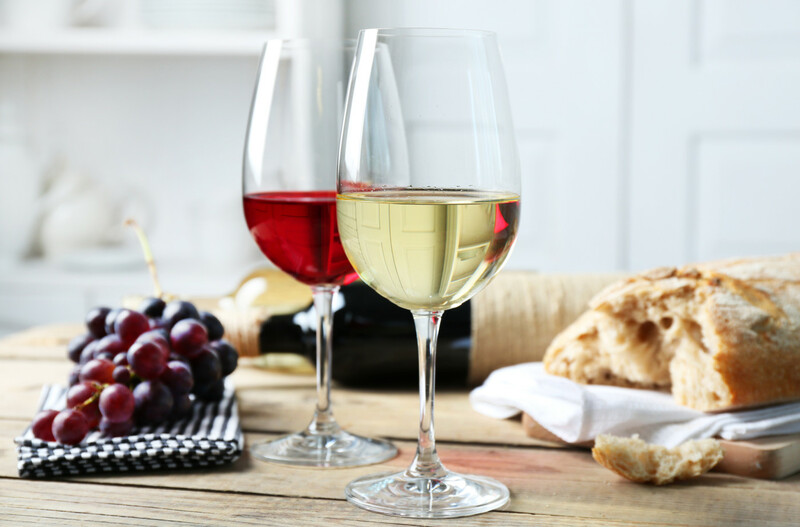 For many wine-with-salad converts, the default wine is white. But lighter reds can work, too, especially if the salad includes heavier, meatier ingredients. A chopped salad from The Casual Vineyard Table, which includes black-eyed peas, spicy Italian sausage, pistachio nuts, cucumbers, red and yellow tomatoes, cilantro and lime juice, works well with dry, acidic whites, such as Sauvignon Blanc, Pinot Grigio or Pinot Blanc, but Wente also suggests her company’s Reliz Creek Reserve Pinot Noir. She pairs the same wine with a salad of grilled quail, potatoes, leeks, green beans and figs that was served at the winery’s restaurant this past spring. "For me, pairing is all about weight and texture," she says. "If you’re gong to have a salad with sirloin strips, maybe a Cabernet is perfect." Not that "weighty" has to mean "meat." Criscuolo serves a misto salad at Basta Trattoria that consists of thick strips of caramelized onion, roasted eggplant and Heirloom tomato, olives and ricotta salata cheese, dressed with a vinaigrette made of Heirloom tomatoes and basil. If her patrons want a white wine, she recommends a Sicilian, Pieropan’s Soave Classico Superiore, but if they’re willing to venture into red territory, then she likes Santa Anastasia’s Nero d’Avola from the Veneto. "I’m always surprised when I hear people feeling uncomfortable about serving wine with salad," says Criscuolo, whose namesake vegetarian restaurant celebrates its 30th anniversary this year. "I always have wine with my salad." Caesar salad is beloved by its fans for its bright, lemony acidity and—for purists who adhere to the classic recipe—the salty tang of anchovies. In recent years, the Caesar salad has been transformed into a satisfying main course by the addition of other ingredients, principally grilled chicken. Criscuolo’s Basta Trattoria does a salmon Caesar, but it’s still not a salad for the faint of palate. "With Caesar salad," says Criscuolo, "you have saltiness that you have to combat; you don’t have nuts or fruit to neutralize the intensity." But pairing a Caesar with wine isn’t as difficult as one might expect, "because it’s based on lemon, it has a different acidic taste than the vinegar," says Criscuolo. At the Restaurant at Wente Vineyards, the Caesar dressing is made with sun-dried tomatoes. For that, Wente says a lighter Zinfandel is a good match. For classic Caesars, both Criscuolo and Wente say that acidic, vibrant whites work well. Think Sauvignon Blanc. Tomatoes are notorious enemies of the grape; the widespread belief is that the acid in the tomatoes distorts the flavor of the wine. Not necessarily so, say both Wente and Criscuolo. "I love tomatoes and I love vinegar and I serve them together all the time," says Wente. She uses tomatoes that have been vine-ripened, which makes them sweeter, she says. She also recommends salting tomatoes to reduce their acidity. Adding a little cheese—as in the ubiquitous Caprese salad of tomato, mozzarella, olive oil and basil—also balances the acidity and imparts creamy richness. Wente pairs a Caprese with a wine that has good acidity and forward fruit, which together complement the acidity and ripe fruitiness of the tomatoes. Criscuolo often favors golden or yellow tomatoes, explaining, "They’re not less acidic, but they appear that way because they have a high sugar content." 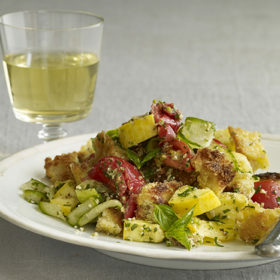 She serves a panzanella with tomatoes, extra virgin olive oil and organic red wine vinegar. She, too, likes a wine with fruity overtones for a tomato-heavy salad. Again, white wines are the way to go. Wente’s favorites are her winery’s Reserve Chardonnay and Savignon Blanc. Criscuolo agrees with the Sauvignon selection, but offers Greco di Tufo as another option. This recipe is adapted from one created by Chef Claire Criscuolo, co-owner of Claire’s Corner Copia and Basta, both in New Haven, Connecticut. Rosemary branches that double as skewers give the shrimp in this salad a wonderful aroma and a festive appearance. Chef Criscuolo uses mild, wine-friendly golden balsamic vinegar and limoncello in the vinaigrette. She likes the organic golden balsamic from Spectrum Organics in California (www.spectrumorganics.com) and recommends organic products throughout the recipe. Food-safety note: Don’t try to save time or dishes by basting the shrimp right from the salad dressing. Instead, use a separate bowl for the dressing that will be used for basting. By not doing so, you could contaminate the rest of the salad dressing with raw seafood juices that might contain bacteria. Any bacteria on the shrimp will be killed during grilling, but if you baste the shrimp, dip your brush back into the uncooked dressing and then dress your salad, you could spread foodborne illness. Prepare a charcoal fire or preheat a gas grill. Soak the rosemary branches in cold water for 15 minutes, then drain. Meanwhile, prepare the dressing. Combine the olive oil, garlic, golden balsamic and balsamic vinegars, lemon juice and limoncello in a cup and whisk well to combine. Taste and season with salt and pepper as necessary. Thread 3 shrimp onto each rosemary branch, gently pushing them together until they just touch. Set them on a plate. Whisk the dressing, then scoop out a couple of tablespoons and pour them into another cup. Using a pastry brush, baste the shrimp from the smaller portion of dressing, brushing all sides of the shrimp. Arrange the mixed greens onto a large serving platter. Scatter the halved tomatoes evenly over the greens. Grill the shrimp for 3-4 minutes on each side until they are opaque and slightly pink. Then arrange them onto the platter of mixed greens. Drizzle the remaining dressing evenly over the salad greens and the grilled shrimp. Scatter the feta cheese evenly over the salad. Serves 4. Wine recommendations: Criscuola’s recommendations are all Italian: Sauvignon Blanc from Friuli, Greco di Tufo from Campania or a sparkling Prosecco. Adapted from Chef Elisabeth Schwarz, at The Restaurant at Wente Vineyards, in Livermore, California. Grilled quail and potatoes give this salad a hearty quality. Look for quail at a specialty gourmet shop or butcher and ask for it to be semi-boned (rib cage removed). Preheat the oven to 400Â°F. Prepare a medium-hot charcoal fire or preheat a gas grill to medium. Brush the quails with olive oil and season inside and out with salt and pepper. Set aside. Heat 1 tablespoon olive oil in a small ovenproof skillet over medium-high heat. Add the figs and sear until they begin to caramelize in the pan. Place the skillet in the hot oven for 5-7 minutes. Meanwhile, bring a small saucepan of water to a boil. Add the beans and cook for 4-5 minutes or until tender. Drain and toss with a little olive oil, salt and pepper. Place them into the refrigerator to cool. Heat 3 tablespoons oil in a medium ovenproof skillet over medium-high heat. Drain the potatoes and place them into the oil in a single layer. Season with salt and pepper. Cook, shaking the pan so the potatoes do not stick, for about 3 minutes or until they begin to turn to a golden brown color. Transfer the skillet to the oven and bake for 10-12 minutes, or until tender and easy to pierce with a fork. Heat 1 tablespoon of olive oil and 2-3 tablespoons butter in a sauté pan set over medium heat until the butter is melted. Add the leeks and cook, stirring and shaking the pan for 5-7 minutes, or until they are very tender. Season with salt and pepper. Remove the figs from the oven and set aside to cool. In a blender or food processor fitted with a metal blade, purée the cooled figs with the balsamic vinegar, red wine vinegar, 1/2 cup of olive oil and salt and pepper to taste. Set aside. Place the quails on the hot grill breast side down and cook, turning them with tongs every 2-3 minutes, for a total of 8-10 minutes or until the breast is springy yet firm to the touch and the meat has a slightly pink tinge. Place the frisée into a bowl, add the potatoes, beans and leeks and all but a few teaspoons of the fig vinaigrette (or vinaigrette to taste). Toss gently until all the vegetables are evenly coated. Divide the salad evenly on four serving plates. Top each plate with 1 quail and drizzle with the remaining vinaigrette. Serves 4. Wine recommendations: Chef Schwarz recommends Wente 2002 Riva Ranch Reserve Chardonnay with this salad. Carolyn Wente likes Wente Vineyards Reliz Creek Reserve Pinot Noir.